You are on level 2 of the Shoals. You have visited 7 branches of the dungeon, and seen 30 of its levels. 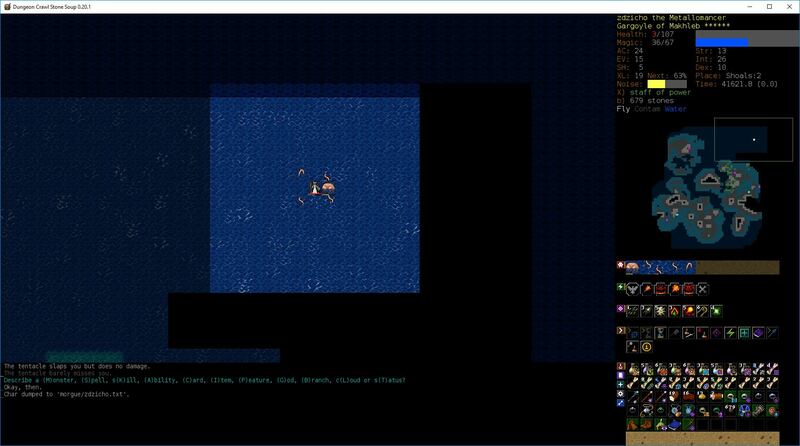 You have visited the Abyss 1 time. You have collected 3661 gold pieces. You have spent 856 gold pieces at shops. You have 31 spell levels left. You are occasionally teleported next to monsters. The iron shot hits the kraken. The kraken is heavily wounded. The tentacle barely misses you. You block the tentacle's attack. The tentacle slaps you but does no damage. The tentacle closely misses you. The tentacle barely misses you. Describe a (M)onster, (S)pell, s(K)ill, (A)bility, (C)ard, (I)tem, (F)eature, (G)od, (B)ranch, c(L)oud or s(T)atus? You can see a kraken and 4 tentacles. 98 | D:1 | Found a shattered altar of Ashenzari. 2839 | D:3 | Found a basalt altar of Yredelemnul. 5631 | D:5 | Found a staircase to the Ecumenical Temple. 6240 | D:6 | Found Nevuom's Antique Weapon Emporium. 9046 | D:7 | Found a runed door. 10510 | D:8 | Found a flagged portal. 16337 | D:10 | Found a staircase to the Lair. 16540 | D:10 | Found a staircase to the Orcish Mines. 18335 | Orc:2 | Found a staircase to the Elven Halls. 18955 | Orc:2 | Found a roughly hewn altar of Beogh. 19880 | Orc:2 | Found Kif Ruis's Antique Weapon Boutique. 19880 | Orc:2 | Found Orulloph's Gadget Shoppe. 19884 | Orc:2 | Found Paidef's Jewellery Shop. 19886 | Orc:2 | Found Fenil's Distillery. 21951 | Lair:2 | Found a staircase to the Shoals. 23471 | Lair:3 | Found a hole to the Spider Nest. 24686 | Lair:4 | Found a stormy altar of Qazlal. 26386 | Lair:6 | Found a staircase to the Slime Pits. 28660 | Elf:1 | Found a portal to a secret trove of treasure. 29149 | Elf:1 | Found Goruwets's Antique Armour Boutique. 30512 | Elf:2 | Found a runed gate. 30516 | Elf:2 | Found a runed gate. 30718 | Elf:3 | Found Asaston's Gadget Emporium. 31542 | Elf:3 | Found Asai's Weapon Shop. 35876 | D:13 | Found a gate to the Vaults. 35950 | D:13 | Found a shadowy altar of Dithmenos. 36048 | D:14 | Found a blossoming altar of Fedhas. 38355 | D:15 | Found a staircase to the Depths. Yes next time don't train earth magic and spellcasting up 20ish without reason. and don't train so high anyway at that point of the game. Don't train poison at all with a char like this, it provides no benefits. Train fighting (I'd say also a bit of armor also with a gr and dodging with other ones). In with specific case: when it's your "turn" you'll always act first and then all others. The kraken has enough low MR that it should reliably affected by ?fear. Anyway I don't know if its tentacles will stop to attack you right away or if its ink cloud, which it will most probably spit, can deal any damage. So I'd wait some other ideas, if there any other way to survive this situation more reliably. 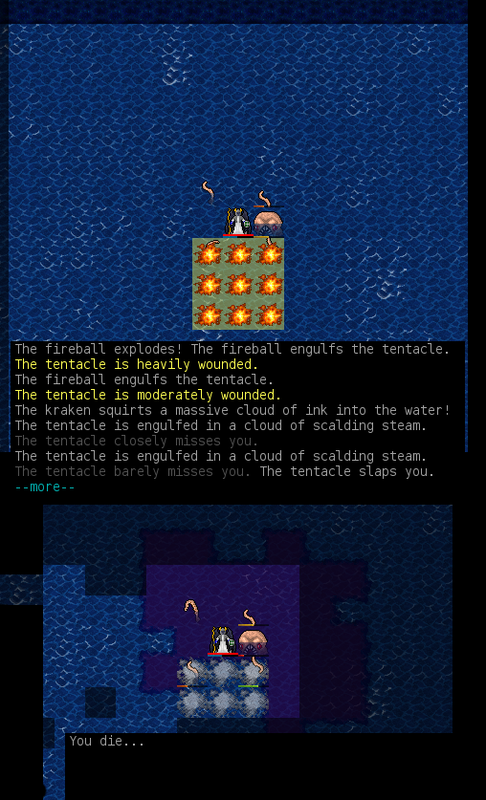 I tried this out in wizmode, and the tentacles are indeed unaffected by fear. Within a turn the kraken will have moved away and taken the tentacles with it, but the tentacles did seem to still get a turn to hit you in my testing. The ink cloud is harmless, it's basically just fog for water. However, I'm not seeing a better option in your current situation either (probably don't chase down krakens in the future). Also, for whatever reason in my testing the kraken recovered really quickly from fear, though it was very likely to be affected, so if you survive, don't linger; the ink cloud should still make it easy to escape. Teleportation is a terrible idea here since just killing the kraken would take less time than waiting for the teleport. As advil said, fear won't work either. I suspect your best chance is to fireball either the bottom two tentacles or the top two tentacles, which has a tiny chance of killing the kraken (slightly better than Iron Shotting the head at your spell power levels, if I've calculated it correctly). But really, you're so thoroughly screwed here that it's comical. You might as well just quit. dont fly in shaols unless you need to cross water. Stay on land. Flying makes you autoexplore useless areas and often puts you out of position where merfolks can swim fast and cut off paths to retreat safely. Also, it can lead to situations like this i guess. And wind drakes airstikre hurts more. In fact, there is no reason to fly permanently unless you are tengu.